Home » morehead memorial hospital , pirates » Yo-Ho-Ho, A pirates's life for me! Yo-Ho-Ho, A pirates's life for me! Tonight was the annual Morehead Memorial Hospital Foundation fundraising gig, and this year's festivities had a North Carolina beaches theme. And since the Carolina coast was once where Blackbeard and other buccaneers practiced their trade, I got asked to help give pirates their due representation. 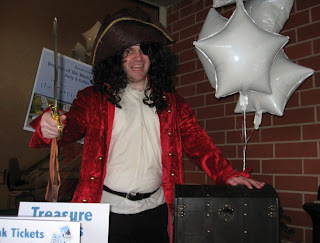 So here's me in a pirate costume. I've been practicing my "Arrrr"s for the past couple of weeks. It was enough to not run out of idiom and let me stay in character for the entire three-plus hours that I was there. 'Twasn't the only pirate: a lady named Shannon from the hospital was also there standing up for the fine tradition of female piracy. For the most part our job was to sell raffle "tickets" that came in these little pirate chests (they're in the big one that I'm guarding in the photo). The fundraiser enjoyed a large turnout and was by all measure a huge success! Christopher Knight, what madness have you wrought?